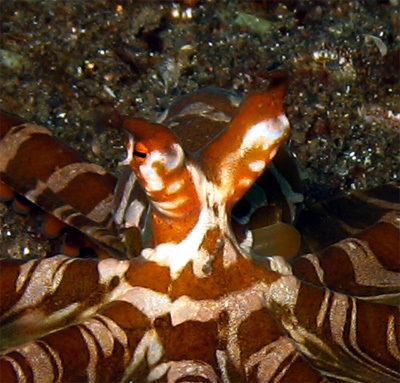 Tips for telling the difference between Wunderpus photogenicus Hochberg, Norman and Finn 2006 (Wunderpus) and Thaumoctopus mimicus Norman and Hochberg, 2005 (the Mimic Octopus). 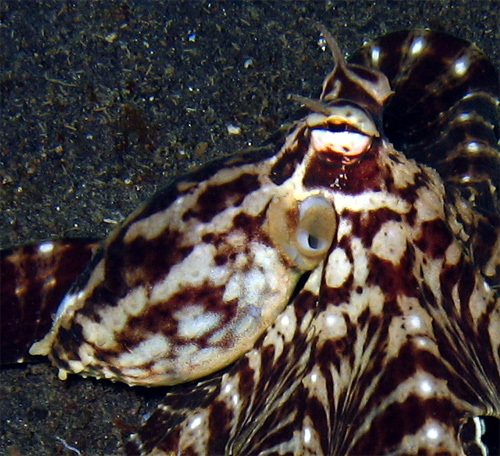 Hopefully these quick hints and photos below will help you identify the “Mimic” octopus (Thaumoctopus mimicus, Norman and Hochberg, 2005) and Wunderpus (Wunderpus photogenicus Hochberg, Norman, and Finn, 2006) from photos or video. 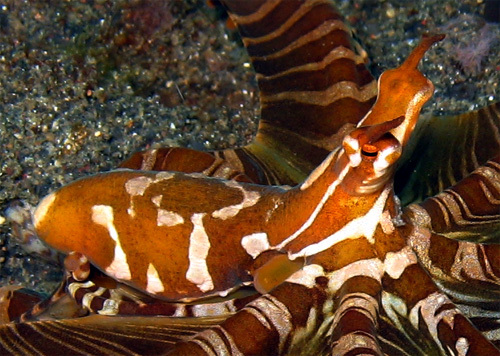 If you’re still unable to identify an octopus in question, please feel free to email us. Who knows, maybe you’ve captured something new! 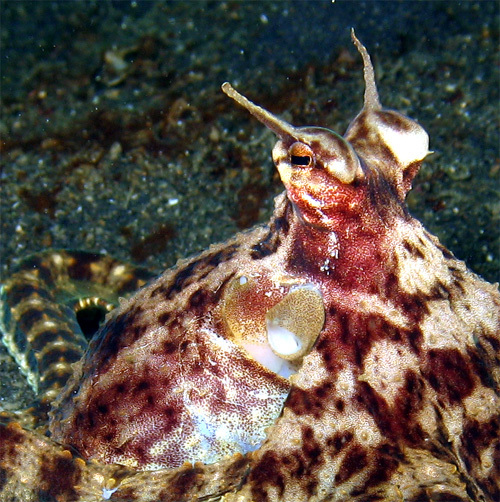 Both T. mimicus and W. photogenicus can have variable activity patterns, however T. mimicus is most often active during the day while W. photogenicus tends to emerge from dens at dusk and dawn, and forages in the early evening and morning. 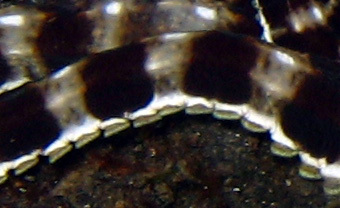 Border between pale and dark brown areas on the T. mimicus is subjective. The dark areas are mottled, making it difficult to identify where they begin and pale areas end, especially on the side of the mantle. 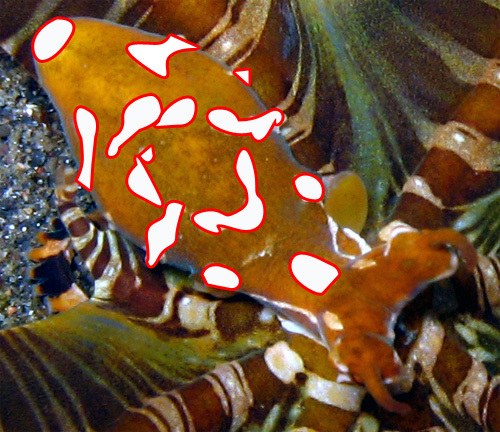 Pale areas connect, while many brown areas can be dark “islands” of color. 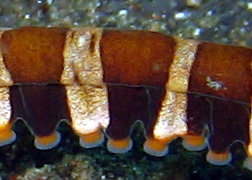 Pale white/yellowish markings on a rusty brown background. The edges of these markings are clear. 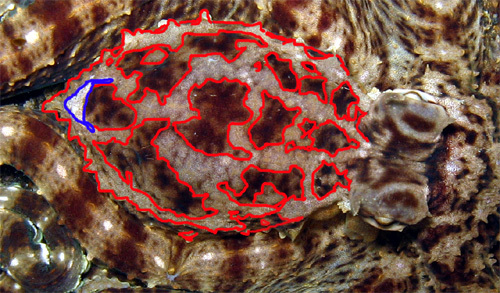 For example, I have easily traced the border between the rusty brown background and the pale areas of a W. photogenicus mantle below. Each of these pale and brown areas is fairly uniform in color, even on the side of the mantle. The brown background is solid, leaving no isolated dark patches. 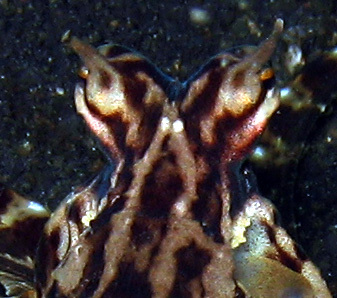 Bright white “V” on the posterior mantle (outlined in blue). No white “V” evident on posterior mantle. Bright white line along base of suckers. No bright white line along sucker base.